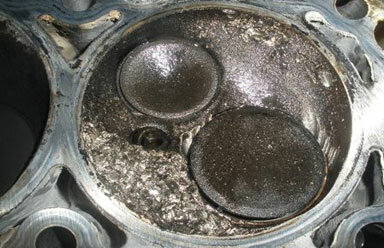 This is a typical intake valve seat failure. It doesn’t matter that this is a 4.7 Dodge pickup truck head. It happens to other car models as well. In most cases it is the intake seats, occasionally the exhaust. I don’t know how much money Chrysler saved per engine but my cost difference between powdered metal (a.k.a. sintered metal) is $.50 on average. Chrysler, to the best of my knowledge, fixed the problem in 2009. Except for the new 3.6 liter V-6. My longtime friend (30 years) is parts manager at one of the local Dodge dealers. I haven’t seen work from him in over a year. When I called explaining I wasn’t sleeping with his wife, asking why haven’t I seen any work from you in a year? He said he has 2 “heavy line” mechanics and they’re too busy replacing 3.6 liter heads under warranty, they don’t have time for customer pay. Chrysler, trying to put out the fire (I presume) is selling those heads brand new, complete cam, lifters, and rocker arms for less than $300. Two months later, it overheated again. These are out of the right side of that engine. If the customer declines all the intake seats, we won’t do the job. Common mistake # 2: Not verifying the rings aren’t seized from a crushed ring land. At first glance you have to replace the piston (this one’s bad), maybe. The cosmetic damage is irrelevant. 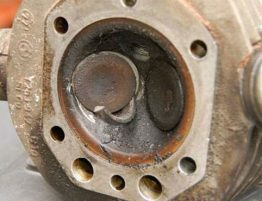 If there are no pieces of the seat embedded (can cause hot spots and you can pick them out) and the piston floats you’re OK. To check whether the ring(s) are seized, with to piston at the top of the bore, try and move the piston from front to back. It won’t move much, a few thousands of an inch. If it moves, you’re OK. The other thing you should do is run the piston down to the bottom of the bore and check for cylinder wall damage. The picture above is and extreme case. Most failures we see are not that bad. 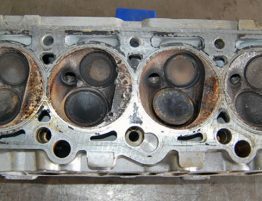 Common mistake # 3: Not cleaning the intake plenum. When this seat failed, the engine, if shut off immediately, still would have turned over a number of revolutions sucking all the “shrapnel” up into the intake plenum. By not cleaning it, more than likely those pieces will be sucked back down into the engine and you might wind up doing it all again, ughhh. If you have any questions about this or any topic (no marriage counseling) please call us anytime, 407-730-9777. 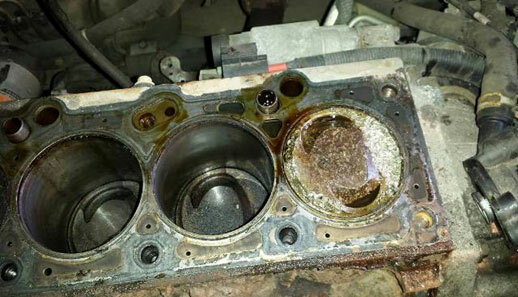 Before tell you a joke pls be kind and inform me why in the cummins cylinder head the EX valve seat broken and make a damaged in the cylinder iner and the piston in the 1st cylinder (Euro 4)6.7 l hope you can help me . 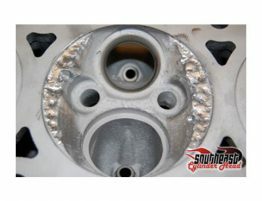 What generation Cummins engine valve seat broke ? call me @ 812-969-2444 thank you!